Well, to be more precise my husband bought me a picture. I turn 40 later this month and am finding it fairly easy to suggest just one more present……….thanks Al. I love you. Normally I wouldn’t add personal stuff to this Cocker Hill blog; but in this case I have a good excuse as the picture is a view from the Cocker Hill Churchyard, looking North East, towards St Paul’s Church, Stalybridge. The building in the foreground was Stokes’ Mill. It is now apartments. The picture is what I consider to be my view, the one I look at with my coffee after the school run in the morning. Most other people look up a the hills or down onto the town centre, but I look down and across the river………So when I saw the painting I had to have it. 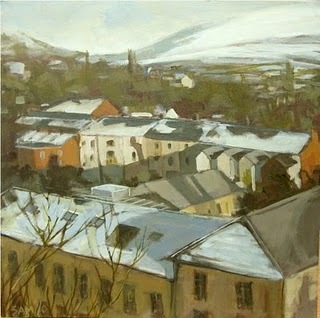 If you want to see more of Sheila’s Stalybridge paintings you can see photos of them on her blog.